Once you’ve mastered, or at least gotten good at, making pysanky, you may find yourself teaching classes. It may simply be that some friends ask you to show them how to write pysanky; or it may be a more formal setting, at a school or church. In either case, it helps to be prepared, to have the necessary equipment, and to know what to expect. Supplies: what supplies do you need to successfully teach a class? Dyes: how many dyes and which ones should you have for a class? Eggs: selecting and preparing eggs for classes. Classroom: organizing your permanent or temporary classroom. Work space: setting up tables for your students to work at. Dye table: setting up the dye table. 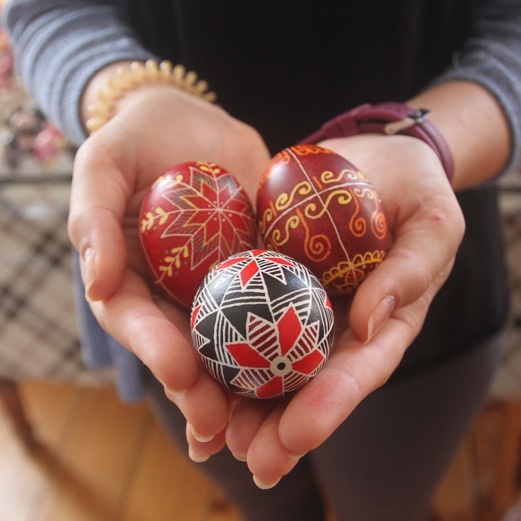 Didactic: what should you discuss with the students before beginning work on pysanky? Some ideas for lesson plans. Multimedia: audiovisual aids in teaching pysankarstvo. Demonstration: showing students how to make a pysanka. Pattern sheets: are they necessary? Which ones should you use? Pencil lines: using the pencil wisely, and helping students know how much is too much. Wax lines: instructing students on wax application and helping them to do so well. Dyeing: how much supervision is necessary and how to make it go smoothly and atraumatically. Wax removal: what is the best way to remove wax in a classroom setting? Finishing: emptying eggs and varnishing–what is appropriate in a classroom setting? Packaging: helping you students get their treasures home safely.